This totally natural blend is highly effective in the treatment of a wide range of skin infections, including ring worm, athlete’s foot and itchiness to name a few. 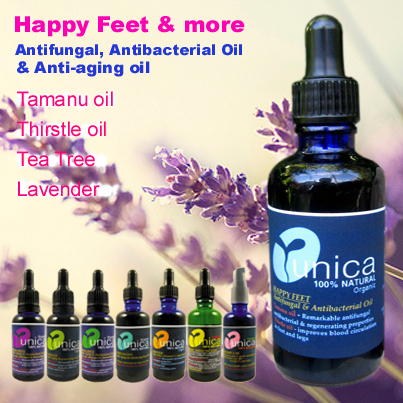 Happy Feet & More organic oil combines the remarkable anti-fungal and anti-bacterial properties of Tamanu oil, unparalleled skin repair agent, with the beneficial action that Thistle oil has on poor blood circulation of legs and feet. Andiroba oil possesses analgesic, antibacterial and anti-inflammatory properties, the latter attributed to the presence of limonoids; Copaiba oil has a powerful antibacterial and antiseptic properties. 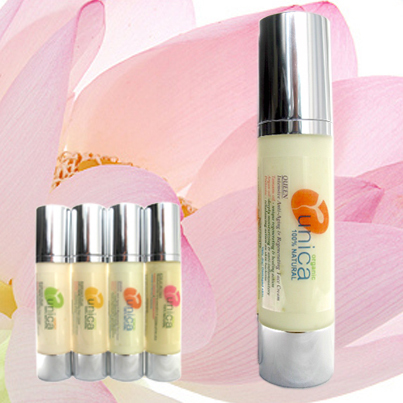 Happy Feet organic oil is also a superb anti-aging regenerating and re-balancing moisturizer. The renowned properties of Tea Tree,Thyme and Lavender essential oils re-enforce the anti-fungal, anti-bacterial and regenerating properties of Happy Feet oil blend. SKIN TYPES: Suitable for all skin types including very sensitive and eczema-prone skin. Happy Feet oirganic oil absorbs readily, leaving the skin feeling smooth and soft. If you are pregnant or breast-feeding consult your doctor before using this product. USE: Apply a few drops with gentle massage. Ideally Happy Feet should be used after a warm bath or shower. "Forget not that the earth delights to feel your bare feet"
The ability of Tamanu oil to heal the skin surpasses that of most, if not all, modern day skin care products. Scientific studies show that Tamanu oil is a significant healing agent because of its ability to produce new skin tissue and because of its remarkable anti-neuralgic, anti-inflammatory, anti-fungal, anti-microbial, antibiotic, antioxidant, and anti-aging properties. Tamanu oil is used effectively to treat a range of infections including ring worm, athlete’s foot, itching of the skin. Because of its cicatrising capacity, (cicatrisation is the process involved in the formation of new tissue), Tamanu oil is amazingly effective for the treatment of everything from acne and acne scars, scarring generally, stretch marks, diabetic sores, psoriasis, sunburn, blisters, burns, cuts, eczema, herpes sore, insect bites and the reduction or complete removal of unsightly age spots.